Royal Purple is a brand name that should be familiar to anyone even remotely interested in the automobile industry, competitive scene, or mechanics in general. 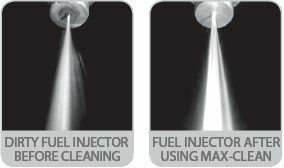 Founder John Williams was a leading developer of high performance synthetic lubricants and as a collective, Royal Purple’s formulators have more than 200 years of experience in producing high performance lubricants. 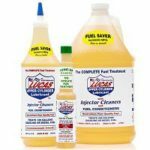 The Royal Purple 11722 Max-Clean Fuel System Cleaner and Stabilizer is a state-of-the-art, wholly synthetic fuel system cleaner that not only penetrates deep into the fuel system and cleans injectors, but also carburetors, intake valves and combustion chambers. The results are notably improved fuel economy and reduced emissions. But don’t take their word, or even mine on it. 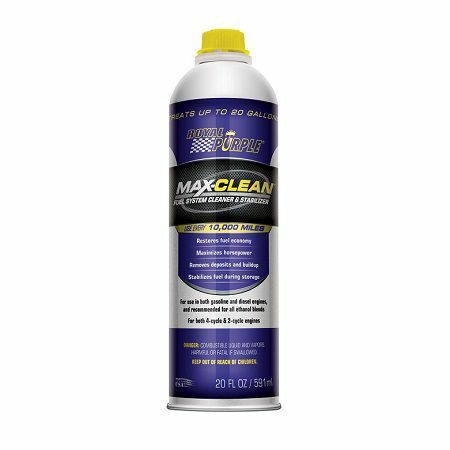 Incredibly compatible, the Royal Purple 11722 Max-Clean is EPA / CARB compliant and safe for use in gasoline and diesel engines including all ethanol blends and biofuel. Personally, I don’t consider it the strongest cleaner, nor the absolute best bang for buck, but if you’re a fan of the brand or you get a good deal, this stuff is definitely worth picking up. It’s safe, it’s super versatile and easy to use!